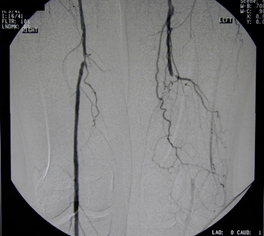 Angiogram – Femoral is an examination of the blood vessels using x-rays and contrast (x-ray dye). A specialist known as an Interventional Radiologist often performs these procedures. Non-healing ulcers on your legs. A narrowing or blockage of the blood vessel most commonly causes these symptoms.